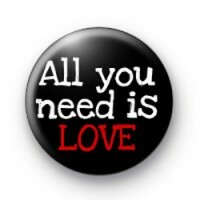 This black pin badge has the simple slogan 'All you need is LOVE' written in bold text. Simple yet true, if you're feeling all romantic and loved up then you need to be wearing this cute badge this Valentines Day. Or just to spread some positive vibes, a reminder to the world that a little bit of love goes a long way. Also is a very famous quote from one of my all-time favourite Beatles songs.